And run for your life. The man is back in town! This lady-killer doesn't mess around. He's got fashion sense, hygiene, piercing piggish eyes and lips that just don't quit. This mideastern Fabio has to beat women (and more than a few men!) away with a Snapple bottle. Get this ... he's single. 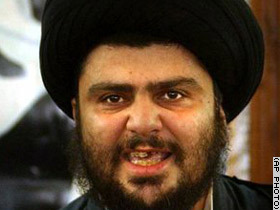 That's right, you too could have a chance for a dream date with Muqtada al-Sadr!